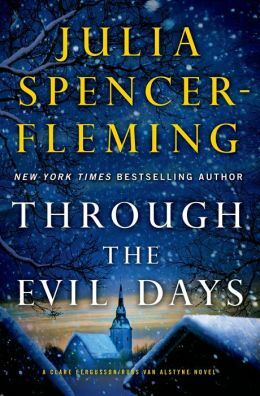 While my East Coast friends have been experiencing a harrowing snow storm, I have been wallowing through the ice and cold with Clare Fergusson and Chief Russ Van Alstyne in Julia Spencer-Fleming’s latest adventure – Through the Evil Days. Clare and Russ are married with Clare 5 months pregnant when the kidnapping of a young girl and a meth gang upturn their ice-fishing honeymoon at a deserted cabin in the woods. Those problems may be not as dire as the threats to close down the Milllers Kill police department and to relieve Clare of her duties as pastor of St. Alban’s. Both Clare and Russ might face a changed future – if they can escape from the criminals and save the little girl’s life. Another daring adventure in the Clare Fergusson/Russ Van Alstyne mystery series – good to read around the fireplace. But I’m happy to be only reading about the icy winter. This entry was posted in authors, book review, books, mysteries, reading and tagged Clare Ferguson, Clare Fergusson mystery, I Shall Not Want: A Clare Fergusson/Russ Van Alstyne Mystery (Clare Fergusson and Russ Van Alstyne Mysteries), In the Bleak Midwinter (A Rev. Clare Fergusson and Russ Van Alstyne Mystery), Julia Spencer-Fleming, mystery, Through the Evil Days. Bookmark the permalink. Sounds interesting. Clare’s a pastor? This is the 7th (or 8th) and they are fun to read in order. Wahoo!! I’ve been waiting for this one!! You won’t be disappointed. Happy reading!